In hopes that all the NYC dreamers out there can plan their next trip to the Big Apple, I’ve put together this 7 Part series about visiting NYC on a budget. New York City is the greatest place in the world (you will love it!) and I think everyone should get a chance to experience it. 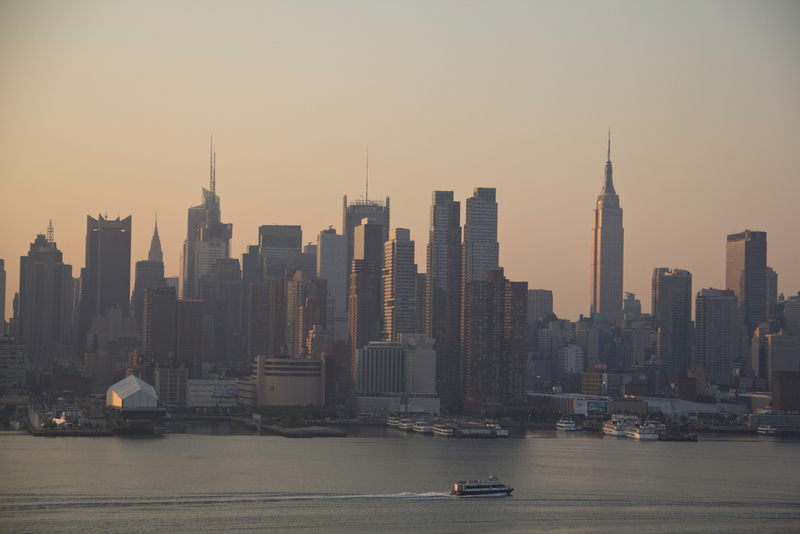 I took this photo of the Manhattan skyline from Weehawken, New Jersey at sunrise. Today is Part 3 of our series Guide to NYC – on a budget: where to stay giving you all the info on the best neighborhoods and hotels to stay at once you get here. Part 1 of our series was The best times to visit, helping you decide what time of year is the right time for you to visit. Part 2 was “How do I get there”, focusing on everything you need to know about the best NYC airports to fly into, taking the subway, bus or cabs and budget friendly tips on getting to and around NYC. NYC has so many different neighborhoods, with different character, different energy, and different things to do. I know it can be overwhelming trying to decide which neighborhood is the best spot for you to stay while in NYC! Thanks to the great transportation options (see last weeks post for more details), getting to your favorite NYC spot is no problem. So, today I’m going to give you my suggestions on some of the best NYC neighborhoods to stay, including a description about each neighborhood, in addition to featuring some hotels and prices, of course, keeping your budget in mind! Midtown/Times Square – this area is from 40th to 59th streets from 6th Avenue to 8th Avenue. It is probably the most popular tourist area in NYC. This isn’t typically a spot New Yorkers frequent. There is a ton of of stuff to do, and from this location you will be able to walk to most of your touristy spots! Theaters, TV Show tapings, shopping and Central Park, is all within walking distance. Hotel Mela Times Square -4 star boutique hotel in Times Square, offering many amenities. Use promotion code TravelZoo Q2 to get rates from $189 a night (35% off) for a limited time. The Paramount -4 star modern hotel in Times Square. The website lists it as “The official hotel of the Tony awards”. Hotels.com currently has rates for select dates starting from $179 (regular $239). Pod 51 – 3 star hotel in Midtown East (about a 20 min walk from Times Square). This hotel has trendy rooms for the traveler on a tight budget. Check out Orbitz.com for rates from $140 a night! Crowne Plaza Times Square – 4 star hotel in Times Square. Views include river views, or lights of Times Square. Priceline.com has rates for select dates from $145. The Meatpacking District, Manhattan – this area runs from West 14th Street south to Gansevoort Street. It area is made up of a lot of old industrial warehouses that have been transformed into trendy boutiques, store, clubs and restaurants. The Highline Park , which was once an abandoned railroad track, is now an elevated park featuring beautiful landscaping while still keeping the original character of the railroad tracks. 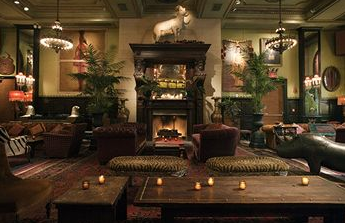 The Jane Hotel – This historic hotel offers a ton of character! Right in the Meatpacking District, many rooms offer views of the River. Smaller rooms (called cabins) have the feel of an old ship, and have shared bathrooms. Rates from $99 a night! 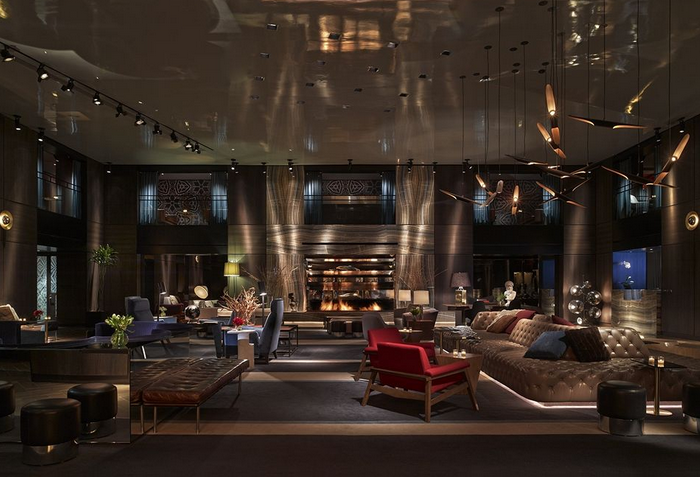 DoubleTree by Hilton New York City – (Chelsea) just a few blocks from the Meatpacking District, this 4 star hotel is a great location offering a lot of a great amenities. Hotels.com has rates for select dates from $189 a night (regular $220). Williamsburg, Brooklyn – at the other end of the Williamsburg Bridge, which connects to Manhattan. This area is bordered by Queens (to the West), Greenpoint (to the North) and Bed-Stuy (to the South). This area has gone through a big transformation over the past decade, attracting many artists wanting the cool scene of NYC without the Manhattan prices. Many now refer to this area as the home to the “hipsters”. McCarren Hotel & Pool – 3.5 star hotel in Williamsburg, offers views on the Manhattan skyline and an outdoor pool. Expedia.com has rates from $265 a night. New York Loft Hostel – located in East Williamsburg, it’s not your typical hostel, offering hip rooms with many different layouts, a TV room, computer room, sun deck, luggage room, and free breakfast every morning. Check out their website for more information, rates from $45 a night! 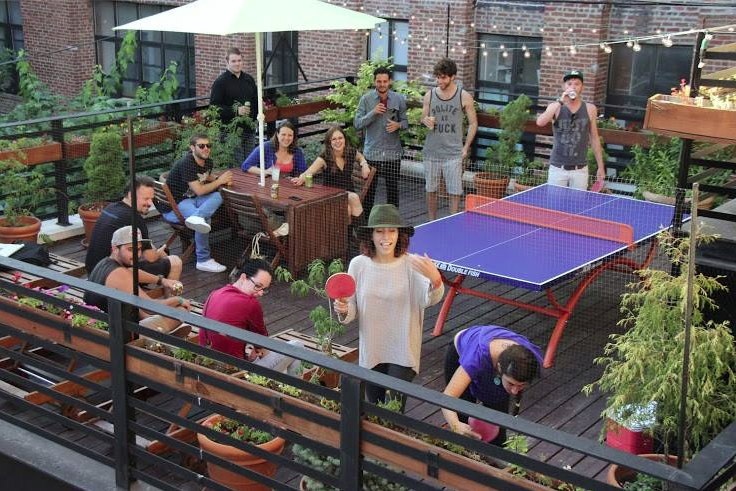 The Sundeck, at New York Loft Hostel, Brooklyn. Photo from NYLF Facebook page. ALoft – I personally stayed here when it first opened a few years ago, and it was the most comfortable bed I’ve ever slept in my entire life! Hotels.com lists it as a 3 star “fresh, new and smartly designed”. They have rates from $179 a night. Long Island City, Queens – just across the East River from Midtown, Manhattan (It is not in Long Island which can be confusing at first). This area has evolved quite a bit over the past decade, a lot of new luxury residential high rises along the water have been built, drawing in executives and artists. This area has lots of restaurants, bars and shopping . Its an easy commute to Manhattan, and it’s very safe. The best part – the views! The waterfront area in Gantry Park offers amazing views of the Manhattan skyline, including the Chrysler Building. 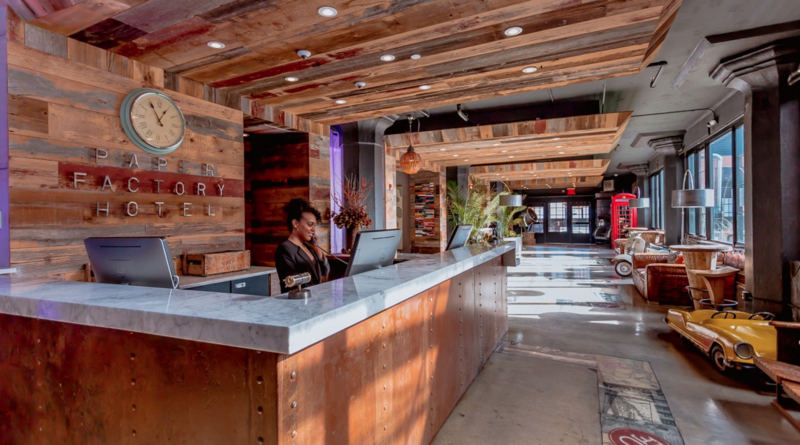 The Paper Factory Hotel– 4 star hotel with a unique artistic boutique vibe. Once an old papermill, the hotel offers alot of character and history as well as amazing views of Manhattan. Hotels.com has rates from $161 a night. Fairfield Inn & Suites New York Queens/Queensboro Bridge – 3 star hotel, offering free breakfast and free wifi. Hotels.com has rates from $139 a night (regular $199 a night). Holiday Inn L.I. City-Manhattan View – 3 star hotel with amazing views! Kayak.com has rates from $136 a night. Hoboken, New Jersey –Hoboken is just across the Hudson River from Manhattan. Its a family friendly location, with beautiful treelined streets and historic brownstones. Washington Street (the main street) has tons of restaurants and shopping. Walk a few blocks to the waterfront and you will find green parks and a beautiful view of the Manhattan skyline. It’s also an easy commute into Manhattan via The Path Train ($2.75), The ferry ($7-10) or the bus ($3.20) all getting you there in 10-30 minutes depending which route. 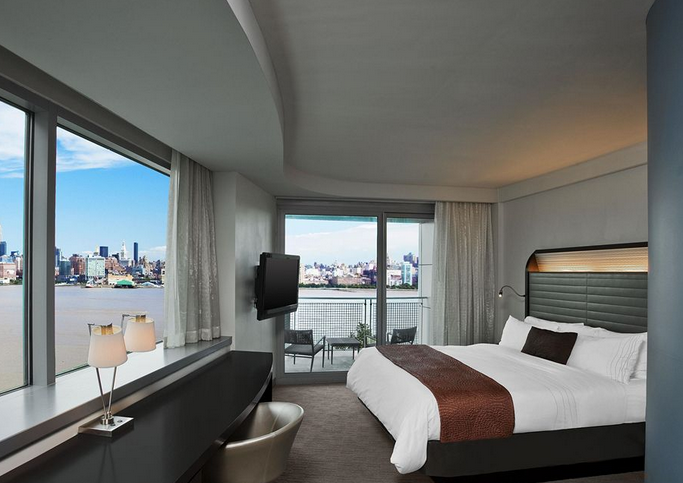 W Hotel – 4 star hotel in the heart of Hoboken, offering clean modern rooms with beautiful views on the Manhattan skyline. Hotels.com has rates from $255 a night. Sheraton Lincoln Harbor Hotel – 3.5 star hotel in Weehawken (1 mile from Hoboken). This waterfront hotel offers amazing views of the skyline. Expedia.com offers rates from $215 a night. Make sure you check around for even cheaper hotel prices on some of these sites. Depending on the dates you might be able to find a better bargain! I hope you are one step closer to planning your dream trip to NYC! Next week in Part 4 of my series I’ll be highlighting The top things to do in NYC, including a huge list of FREE things to do! Do you have any question about this series, or about visiting NYC? For those that have visited the Big apple, what is your favorite NYC neighborhood? Let me know in the comments below! Gosh. Your website is so informative which makes me regret not seeing it earlier before i made all my booking. Such an awesome website. Thank you so much for the compliment! I’m so happy you like my site and it’s helpful for you! That’s my goal! Please let me know if I can help you at all with your NYC travel plans! You will love it!